In 1853, shipping magnate Cornelius Vanderbilt acknowledged that he was worth $11 million and reported that his fortune brought him an annual return of 25 percent. Less affluent Americans found themselves in the chips, as well: Potato chips were invented at Moon's Lake House in Saratoga Springs, New York, when chef George Crum peevishly shaved potatoes paper-thin after a diner complained that his french fries were too thick. Although the Civil War was less than a decade away, many Americans were preoccupied with meat-and-potatoes issues, including their own net worth. Gold and silver played a big part in their calculations. As gold became more plentiful, its value declined in relation to that of silver; put another way, the value of silver increased in relation to that of gold. Either way, the result was the same: Silver coins all but vanished from circulation. It was really a matter of simple economics. Up to then, silver coins with a face value of $100 say, 200 half dollars would have had enough bullion value to buy $100 in gold coins. Now, with the new relationship, that same $100 worth of silver was enough to buy more than $106.50 in gold coins. Bullion speculators melted silver coins to buy up gold coins, then used those gold coins to buy more silver coins and repeated the process over and over. 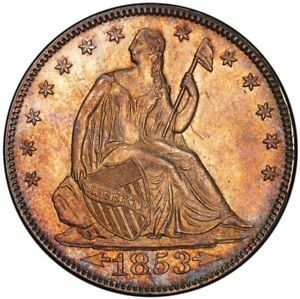 By 1853, most U.S. silver coins were worth significantly more as metal than as money, and melting was rampant. Mint Director George N. Eckert came up with a plan. He called on Congress to lower the weights of most of the silver coins to the point where melting them wouldn't be profitable any more. Congress balked at the prospect of debasing the coinage in this way, but most legislators had difficulty grasping the nuances of the issue. Legislative debate was intense, primarily against the idea of a fiduciary coinage, which was thought to be dishonest, but there seemed to be no other way out of the dilemma. Ultimately, the necessity to do something about the problem forced Congress to go along. The Coinage Act of February 21, 1853, considered a temporary measure until the value of silver stabilized, lowered the weight (and thus the silver content) of all the silver coins but the dollar and three-cent piece by approximately 7 percent. (The three-cent piece was already a subsidiary coin and was not being melted.) This had the effect of reducing the relative value of gold and silver in most U.S. coinage to slightly less than 15 to 1. It also had the effect of greatly diminishing the widespread melting and, in the process, restoring silver coins to the nation's commerce. Curiously, retaining the old standard in the silver dollar would seem to be at odds with the intention of the legislation. As Congress was strongly divided on the entire question, it's probable the dollar remained as it was as a sign of the nation's continued allegiance to bimetallism. Regardless of the intent of this symbolism, the country was, for the moment, effectively on a gold standard. Because of the emergency nature of this action, there hadn't been time to prepare and obtain approval for new designs. Still, Mint officials understandably felt the need to make the new coins readily distinguishable from the older, heavier coins. Otherwise, they too, might be subject to melting. Weighing the coins would make the difference apparent, to be sure, but Mint officials wanted something even more immediately obvious. They hit upon the idea of placing arrows next to the date. At that time, there were six silver coins, and five of them (all but the three-cent piece) had a common obverse that featured a portrait of a seated female figure representing Liberty. This Seated Liberty design had been fashioned by portraitist Thomas Sully and executed by Mint engraver Christian Gobrecht. 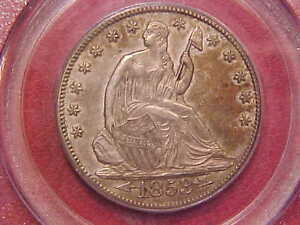 It first appeared on the half dollar in 1839, replacing the Capped Bust design. 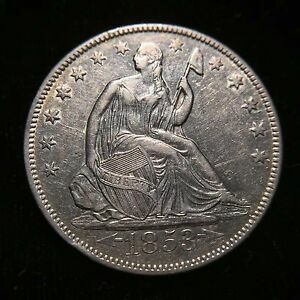 Four of these Seated Liberty coins, the half dime, dime, quarter and half dollar had their silver content reduced in accordance with the new legislation, partway through production in 1853. From then through the end of 1855, all bore arrows beside their dates. 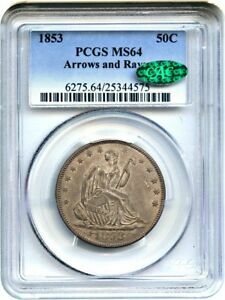 Seated half dollars with arrows and rays were struck at two mints, Philadelphia and New Orleans (with the "O" mint mark below the eagle), and both had relatively high mintages. Being perceived as common, though, they weren't widely saved in mint condition, and high-grade pieces are surprisingly scarce. Points to check for wear include Liberty's head, breast and knees and the eagle's head and wing tops. Bowers, Q. David, United States Dimes, Quarters, and Half Dollars, Bowers and Merena, Wolfeboro, NH, 1986. Wiley, Randy & Bugert, Bill, The Complete Guide to Liberty Seated Half Dollars, DLRC Press, Virginia Beach, VA, 1993.